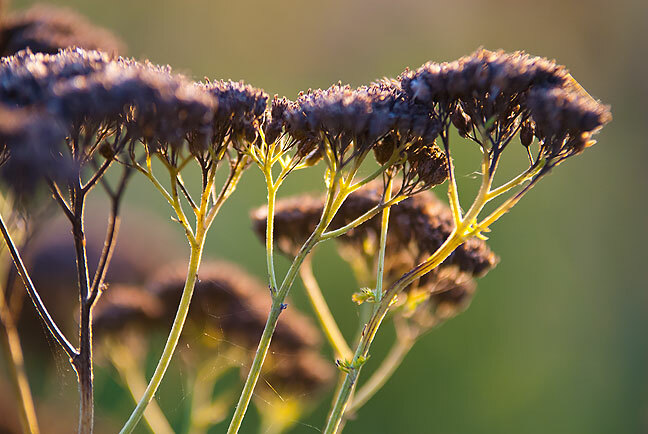 These tall plants bear tiny white blossoms early in the season which turn brown by mid summer. The hay guy came yesterday to cut, rake and bale the pastures. He normally comes in early July, but we had rain, so it was too wet. In advance of his arrival, I photographed it all as it grew and bloomed in June. He cut all the pastures, including the west pasture, the north pasture, and my favorite, Louis Pasture. Magic radios. This one irks me the most. I’ve been to plenty of crimes scenes, accident scenes, and fire scenes, and I listen to public safety comms every day, and I can tell you with certainty that comms are the first thing to break down in a crisis, both psychologically and technically. Even every day comms are disrupted by simple things like hills, buildings, metal objects, even vehicle and body position. Sirens, sirens, sirens. Instead of blaring sirens every chance you get, why not just call the criminals and tell them you’re coming? You’ll wake up fewer neighbors that way, and the result is the same. No cover or soft cover. Protagonists fight their way through scene after scene behind cardboard boxes or, in some cases, nothing at all. No cop or soldier does this, because it will get you killed. I know it’s filmed it this way so we can see the actors. Also, note to television producers: handheld shields, car doors, and body armor do not stop rifles rounds. Doing all the jobs. CSI started this trend when writers discovered that criminalists’ jobs are boring to an average television viewer, and needed them to arrest and shoot and negotiate and diffuse bombs and so on. Flashpoint did the same thing, and it’s absurd. SWAT teams aren’t med units, nor are they firefighters or bomb techs or hostage negotiators. Any city that has a SWAT team has all those specialists. Failing to shoot. An angry drug dealer has a soccer mom at gunpoint, and our heroes, 15 feet away, seem unable to act, at least for most of the 44 minutes of the episode. 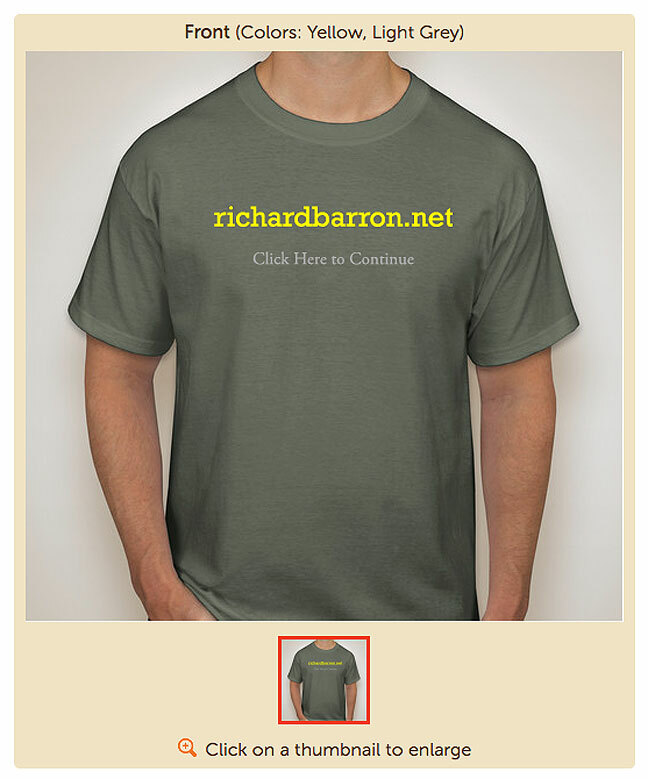 Congratulations to Dennis Udink (udink.org) for winning the richardbarron.net t-shirt contest. He didn’t pick the winning slogan (it came to me in a dream), but he had the most and best suggestions. A richardbarron.net t-shirt is on its way to him. Naive about restrains. There is a reason police cuff suspects hands behind their backs: if a suspect is going to try to kill you, he’ll do it with his hands. Often in shows like Flashpoint, we see both criminals and police bind subjects’ hands together in front, and this usually means that later in the plot they will be able to use their hands. Also, duct tape is a completely ineffective gag. You can get it off your mouth in about three seconds just by opening your mouth. Too many Mexican standoffs: In just the first episode of Flashpoint, a uniformed officer is confronted with a man who had a brandished gun, and who points it directly at the officer. The officer, despite eminent threat, merely repeats his order to “drop the gun,” and the suspect is able to grab a hostage. Just shoot him! Not wearing helmets. This one is also about the actors, whose faces we need to see so we stay involved, but helmets are an absolute must for any kind of an assault team. Not enough backup. The idea here is that our two or three or four heroes are going into the mall to find the suspect and bring him to justice, but my math says that within ten minutes of the “shots fired” call, there are a hundred cops on the scene. Choosing a sub-machine gun for CQB: The trend in law enforcement rifles in the last ten or 15 years has been toward various iterations of the AR-15, mainly in reaction to several significant shootouts like the North Hollywood shootout in 1997. The trouble is one of the basic rules of a gunfight: there will almost always be more people you don’t want to shoot than you do want to shoot. The AR-15 fires a high-velocity rifle round; in its variants, it can shoot a 5.56mm NATO, 7.62mm NATO, the 300AAC Blackout, and others, all of which have the potential to “over penetrate” and strike unintended targets downrange. The main rifle used in Flashpoint is the HK MP5A3, a short-barrel rifle that fires the 9mm round, which, in my opinion, is lethal enough while offering less risk to downrange collateral. Well-written, human concerns and behaviors involving our protagonists. It helps keep characters multi-dimentional if you give them realistic flaws. It took less than a month for Abby to rip through the entirety of Flashpoint, and I was along for some of the ride. It’s a good show, it’s style is edgy, and we got interested in the plots and characters. If you have Netflix, it might be worth your attention. 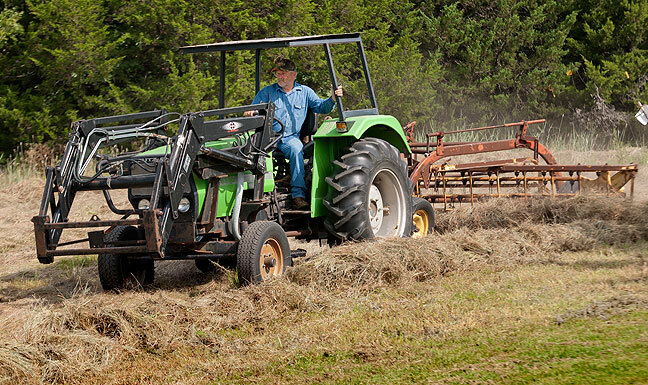 Our month-late hay guy chugs along on his tractor as he rakes the pasture he cut in preparation for bailing it. I’ve added Season 1 to my queue (we’re still on the hard-copy version of Netflix). As for your police procedural reviews, I agree on nearly every point (the others being things I hadn’t noticed). Perhaps not to the same degree as you, I’ve been to plenty of these scenes — the Seminole County variety, and you’re dead right about the radios. I’ve also been on a ride-along when we went into “hot pursuit”. With the engine revved up and the radio on full blast, the cop I was riding with could not understand the other cops (neither could I). The dispatcher was clear enough, but everyone else was breaking up. And yes, movie/TV people have GOT to sort out the difference between penetrating and non-penetrating bullets. The door or trunk lid of an automobile will not stop the bullet of a high-powered rifle; it’ll go right through like it was a piece of paper. Love this, and the take on the weapons wonder if that is why the public as a whole has no clue,too much TV, too many CSI blue lights for a stolen XBOX…yeah that is going to happen locally. It has always bothered me when, in otherwise fairly realistic police procedural programs, cop cars come roaring up to the scene, lights and sirens blaring, when the smart thing would be for them to just kind of, you know, not do that in order to, you know, arrest lawbreakers n such. Okay, finished Season 1. The last episode had flagrant examples of your “no cover or soft cover” complaint. Long-range rifle bullets bouncing off *air conditioning units*, for goodness’ sake. I’ve seen rifle bullets go through a refrigerator.